The NRLA Gotthard Axis comprises of the Gotthard Base Tunnel and the 15km-long Ceneri Base Tunnel. The two single-track tubes of the Ceneri Base Tunnel are complemented by branch-off structures to allow additional traffic connections. So that the ambitious time schedule can be met despite difficult geological conditions, work on lining the tunnel is proceeding in parallel with driving. Marco Ceriani, Chief Construction Officer of AlpTransit Gotthard Ltd, gives further construction status details. Covering a distance of 15.4km, the Ceneri Base Tunnel (CBT) passes under Monte Ceneri from Vigana, near Bellinzona, to Vezia, near Lugano. Situated just inside the north portal are the underground branch-off caverns at Vigana. In a future construction phase, these will permit crossing of the Magadino Plain. The line to Locarno will enable direct connections from and to Lugano. It will reduce the journey time from today’s 55 minutes to 22 minutes. In the vertical axis, the route of the CBT climbs 110m from the lowest point by the north portal at Vigana to Vezia. For most of the distance the gradient is never steeper than 7‰, except for the short section between the caverns at Sarè and Vezia, where it is between 10‰ and 12.5‰. When designing the CBT, the most up-to-date safety aspects had to be considered. To take account of these, the plans include crosspassages at intervals of 325m for evacuation and incident ventilation in the operating phase. Including cross-passages and access adits, the combined length of the two single-track tubes of the CBT amounts to around 40km. The cross-sectional areas of the drives (except for the branch-off structures) vary between 62m2 and 87m2. The resulting volume of excavated rock is around 3.5 million cubic metres. North of the Ceneri Base Tunnel’s north portal, at the so-called Camorino hub, a comprehensive reorganisation of the traffic infrastructure in the Magadino Plain is taking place. Shown in Figure 3, to enable the new tracks from the Ceneri Base Tunnel (point 1) to be joined to the existing Bellinzona-Locarno/Luino railway line (point 2), various built structures are required. The most conspicuous are the four-track bridge over the A2 motorway (point 3), the two single-track railway viaducts (points 4 and 5) with a length of 1,010m and 440m respectively, and the four-lane underpass of the cantonal road (point 6). In the future, the shorter viaduct, with a length of approximately 440m, will carry trains travelling south from Bellinzona to Lugano from the new bridge over the A2 motorway, over the cantonal road, to the CBT. The shorter viaduct has been structurally complete since the end of 2014. The longer viaduct, with a length of approximately 1,010m, will carry trains travelling north from Lugano to Bellinzona from the portal structure of the CBT to the new bridge over the A2 motorway. The reinforced-concrete work is complete; the remaining work operations on the concrete structure (including pre-ballasting) will be completed by the beginning of 2016. The height of the viaduct allows the junction between the Locarno–Lugano line and the future continuation of the NRLA to the north to take place at the existing level. Instead of classic vertical supports, for both viaducts the characteristic V-shaped supports were chosen. This system has the advantage that the horizontally acting braking and tractive forces are optimally transmitted into the foundations and the displacement and torsion in the dilatation joints can be minimised. The north portal of the CBT is located in the vicinity of Vigana. Here in loose rock the A2 motorway had to be tunnelled under at a depth of only 9m. The stipulation in the project of strict separation of the two single-track tunnels as far as the portal, and compatibility with the later continuation northward to the Gotthard Base Tunnel, as well as a separate connection to the main line in the direction of Locarno and Bellinzona, cause a requirement for branch-off caverns in the area of the north portal and splitting of the tunnel portal. Already in 1997, a 2.7km-long exploratory tunnel was excavated at Sigirino. This yielded valuable information about the geology. In 2008, the 2.3km-long construction adit was cut with a tunnel boring machine. At the end of this adit are two underground caverns in which the construction site installations for the main drive and its lining, such as a concrete-making plant, are accommodated. Since 2010, two single-track tubes are being conventionally driven from here to the north (8.3km) and two to the south (6.1km) simultaneously. 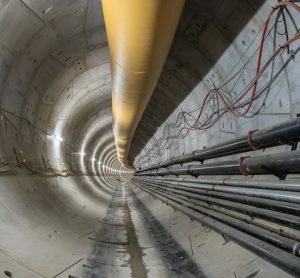 The remaining sections of the tunnel are being constructed by inward driving from the north portal (Vigana) and south portal (Vezia) in two separate lots. The reason for the complete separation of the two portal lots from the main drive itself is that construction of the portal structures had to fulfil special requirements: at the north portal, passing under the A2 motorway and caverns at Vigana, and at the south portal the limited space, proximity to heritage-protected buildings and shallow depth under a road tunnel. The main deposit for excavated material, with a volume of around three million cubic metres, is located at Sigirino. Removal of the excavated material from the tunnel is performed entirely by belt conveyors through the access adit. Located immediately adjacent to the portal of the access adit is the spoil processing plant. The geological forecast indicates that up to a quarter of the aggregate required for concrete making can be produced on-site from excavated material. There is also a direct connection to the railway network, which secures the logistics for problem-free delivery of cement and external aggregate material. Vezia is the site of the south portal of the CBT. Approximately 2km north of the portal, still inside the mountain, the branch-off structure at Sarè has been excavated. Its two caverns permit future realisation of the continuation to the south without interrupting operations in the railway tunnel for a long period. To protect the nearby inhabited areas and buildings – such as the cultural-heritage protected Villa Negroni – driving in solid rock was performed with only minimal amounts of explosive. In addition, the railway tunnel passes only 4m above the newest Vedeggio–Cassarate road tunnel of the Lugano bypass, which also called for protective construction methods. From the south portal of the CBT, a 200m-long overground section connects to the existing railway line. Driving in the Ceneri Base Tunnel is well advanced. On 30 March 2015, the miners excavated the last metres of rock in the east tube between Sigirino and Vezia. This means that around two weeks after the first breakthrough in the west tube, both single-track tubes of the CBT to the south had been excavated. Driving to the north is still progressing at full speed. The distance remaining to be excavated before the breakthrough point at Vigana is around 1,100m in both tubes. If all goes according to plan, the final breakthrough of the CBT will take place at the beginning of 2016. Sixty percent of the east tube has been lined, while in the west tube only 25% of the vault has been concreted. Construction of the benches has already begun. Lining of the tunnel continues and installation of the tunnel infrastructure systems in the cross-passages (ventilation, doors, and technical floors) will be completed by the start of 2017. The inward drives in the north (Vigana) and south (Vezia) are complete and lining in these areas is also largely complete. 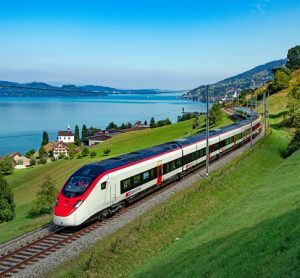 In August 2013, AlpTransit Gotthard Ltd awarded two large lots for installation of the railway systems (‘Railway Track & Logistics’ and ‘Railway Systems & Coordination’). Objections were submitted to both of these awards. In September 2014 the Swiss Federal Supreme Court finally rejected these objections and confirmed the awards. However, the objections have caused the start of work on the railway systems to be delayed by one year. A detailed analysis was recently performed as to whether and how this delay could be made up. Based on the results of the negotiations and the associated risk assessments, AlpTransit Gotthard Ltd has concluded that the risks resulting from acceleration measures would be unacceptable and that such measures will therefore not be implemented. In consequence, operational opening of the Ceneri Base Tunnel is now foreseen to coincide with revision of the railway timetable in December 2020. In the Gotthard Base Tunnel, final work operations on the railway systems will continue until mid-2015. The systems will be restored to their new condition and temporary systems will be switched over to permanent systems. From 17 August until 30 September 2015, overall integration tests will take place. The tests are the preliminary to test operation. All monitoring systems such as the tunnel control system and train control system will be thoroughly tested. 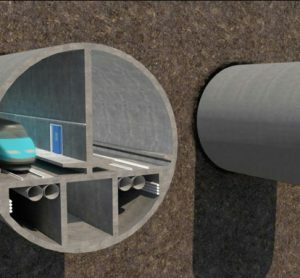 If the overall integration tests are successful, it can be assured that the trains can travel through the tunnel without danger. The basis will then have been laid for the release for test operation by the Federal Office of Transport. From October 2015 to the end of May 2016, test runs with trains will take place in the tunnel as well as on the approach sections in the cantons of Uri and Ticino. These test runs will deliver the proof that safety is assured, that the system functions and that operations can begin. The tests will take place in a total of 1,000 shifts and involve around 1,000 people. 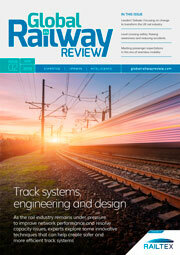 In May 2016 a major overhaul of all systems will take place as well as the final handovers. In addition to the various tests, the last temporary systems will be removed and the railway systems installations sites will be cleared. So that the systems remain functional, they must also be maintained. Marco Ceriani is Chief Construction Officer and a Member of the Executive Board of AlpTransit Gotthard Ltd since 2012. He was formerly employed by Swiss Federal Railways as Deputy Overall Project Leader of the Cross City Link in Zurich and Section Leader of the Weinberg Tunnel and has also held positions as Project Leader and Product Manager with various engineering companies. Marco Ceriani holds a degree in civil engineering and a diploma in engineering management.